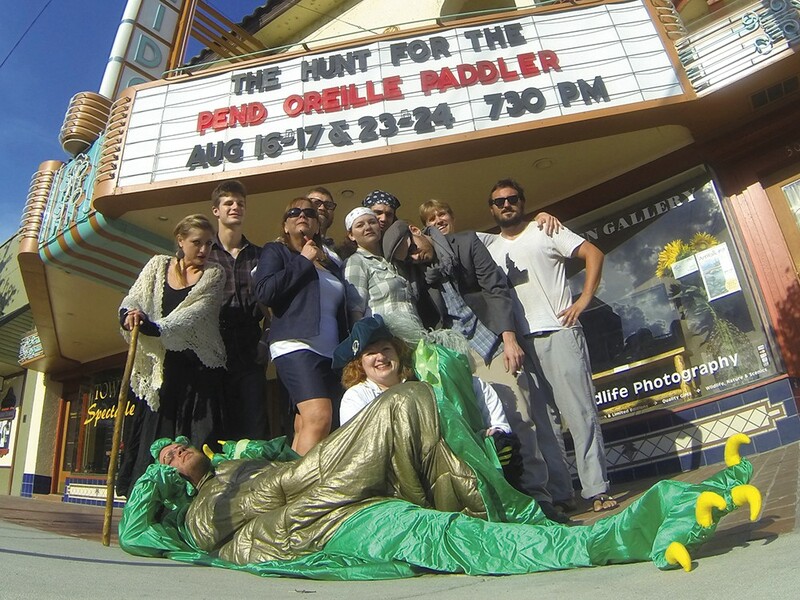 Ben Olson, far right, and the cast of The Hunt for the Pend Oreille Paddler. Ben Olson hasn’t stopped pushing for social change in his native Sandpoint; he’s just altered the form it takes. Instead of rolling the rock uphill — like Sisyphus in the Greek myth or Albert Camus’ existential antihero — Olson has channeled his passion and angst into his music, his photography, and especially his writing. “I have this stubborn, atavistic desire to keep my town real, to forbid any changes that pull us closer to douchebaggery, to resist the influence of money and development,” says Olson. His involvement with the Sandpoint Reader from 2004-08 (the newspaper closed in 2012) honed his journalistic skills and provided a ready forum for his musings (some would say rants). His reputation as a gadfly climaxed in 2008 during an only slightly tongue-in-cheek Airsoft pistol duel between himself and former city councilman John T. Reuter. Now his activism comes in the form of writing, says Olson, whose first theatrical production, Death of a Small Town in the West, was about a rich developer planning to bulldoze the town. Consider his band, Harold’s IGA, named for a longtime Sandpoint grocery store leveled to make way for a behemoth bank building. After Death, Olson lightened up a bit with Sperm! The Musical, highlighting infertility, but also touchy subjects like abortion and genetic modification. Although Olson says he doesn’t like musicals, music is another matter. He writes music, sings — slightly nasal and raspy but pleasant, like weathered, rough-hewn wood — and plays guitar for Harold’s IGA. They perform locally, occasionally in Portland or Seattle, sometimes featuring up-and-comer Holly McGarry. Some songs, like “Western Heroes?” carry political overtones about historically important and controversial figures, such as “Unabomber” Ted Kaczynski and Industrial Workers of the World founder Bill Haywood. Others, like “Lighthouse Man,” might remind you of Jakob Dylan’s overcast soulful stylings, peppered with unusual instruments like the xylophone, accordion, ukulele, and banjo. He wrote a few songs for his next production, The Hunt for the Pend Oreille Paddler, which runs Aug. 16-24 at the Panida Theater. It follows four residents of Northsaint (Sandpoint’s doppelgänger), all intent on ferreting out the monster from the lake believed responsible for the death of a local fisherman. Olson’s way of railing against the absurdities in life, sometimes, is to embrace them, turn them on their ear. Like his writing, Olson’s photography is straight-up, unsentimental and a bit quirky, like the black-and-white that photos landed him in the Tinman Gallery’s 2011 “20 Under 40” juried exhibition. “Stylistically, I’ve always been drawn to odd, morose photographic styles” and portraiture like that of Walker Evans and Mike “Disfarmer” Meyer, says Olson, whose interest in photography kicked in with Mark Story’s Living in Three Centuries project. Olson’s job for Story’s photographic catalog of centenarians, which received awards from Photo Review and Lucie International, was to travel across the U.S. in search of subjects, then help Story shoot the photos.